Mail delivery by large boat wasn’t practical because of the extremely light volume and the trip by small boat was dangerous. So in 1885 the U.S. Post Office established a route along the beach. Every Monday a mail carrier left Palm Beach with his lightweight canvas bag of letters packed inside his knapsack. After walking a while, he crossed a lake with a rowboat which had been safely secured in a hidden location on the shoreline. The rest of the journey involved beach walking (shoes were carried and pants rolled up) plus more trips across waterways, the last being a twelve mile ride down Biscayne Bay to Miami in a small boat fitted with a sail in the event of a favorable wind. Mailmen spent the night at Houses of Refuge along the way at Orange Grove Station (Delray Beach) and Fort Lauderdale. These houses served as weather observation posts and a safe haven for ship-wrecked sailors. The return from Miami began the next morning. The grueling mail route took six days to make the roundtrip, covering a total of fifty-six miles by boat and eighty miles of beach walking. The men had to provide their own food since fast food franchises had not yet been established. They packed some food but also lived off the land, gathering turtle eggs, oysters, coconuts and oranges from abandoned groves. Sometimes they fished and carried the surplus in their knapsacks, which gave the mail a distinctive bouquet. Postal workers lived in the Hypoluxo/Palm Beach area. For some, farming was a primary occupation, with vegetables being the primary crop. But the 600 dollars per year for full-time delivery left them with no time for pursuing other interests, causing them to split the route with another hardy soul. 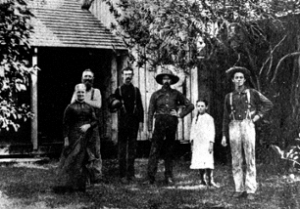 In the Photo, Left to Right are: Captain Hannibal D. Pierce, Margretta M. Pierce, Andrew W. Garnett, James (Ed) Hamilton, Lillie E. Pierce and Charles W. Pierce. Photo from Henry E. Oyer III. Only one tragedy struck the close family of mail carriers and the cause remains a subject for speculation. In 1885 James “Ed” Hamilton and Andrew Garnett moved to Hypoluxo from Trigg County, Kentucky and began farming on some muck land they had purchased. Garnett took the job of postmaster in 1887 and the unfortunate Hamilton became a mail carrier. On October 10, Hamilton picked up the mail in Palm Beach and stopped by Hypoluxo to have dinner with Charles Pierce. The muscular Kentuckian complained that he wasn’t feeling well but said he could complete the route with the help of some pain-killer he had brought along. Later investigation showed that a stranger had found the hidden mail boat and utilized it to cross over to the other side. When Hamilton saw the boat on the other shore, he decided to swim across and retrieve it. But in his poor state of health and a recent influx of alligators, his fate would appear to be obvious. A few years later, Pierce noted that a man’s jawbone with a gold tooth had been found on the west side of the lagoon. However, no one could remember if the Kentuckian had any such dental work. The mailmen also acted as guides for “passengers” traveling to Miami. There was a charge of five dollars, which included meals. The money was to pay for lost time since no one could maintain the pace set by the postmen. The constant rest stops caused them to tire faster than the steady walking they were accustomed to. In addition, the passengers did not always have the mailmen’s best interests in mind. Charles Pierce once was conned into guiding a man to Miami without paying. One unhappy passenger decided to deliver a little payback by sending some money to a friend in Miami and asking him to send six heavy coconuts by return mail. The postman, enduring the summer heat, made the delivery. And then there was Henry J. Burkhardt. Not only was he a good beach walkist, he proudly walked the route in his birthday suit, touting the healthful benefits of sunshine. The era of the barefoot mailmen ended in 1892 upon completion of a rock road from Jupiter to Miami. The Bay Biscayne Stage Line then acquired the contract to carry the mail south. Few reminders of this unique period in U.S. Postal history remain. One is a plaque in memory of Ed Hamilton, who gave his life in an effort to deliver the mail. It can be found just north of Hillsboro Inlet Bridge on the east side of the road, near Pompano Beach. Also, on the grounds of the Hillsboro Inlet Lighthouse is a statue of the barefoot mailman in stride. 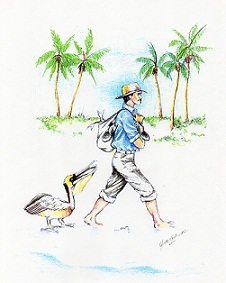 And a series of murals depicting a barefoot mailman walking the beach can be seen at the West Palm Beach Post Office. A good reference source is the book, Pioneer Life in Southeast Florida, by Charles W. Pierce, edited by Donald Walter Curl, University of Miami Press, Coral Gables, Florida, 1970.